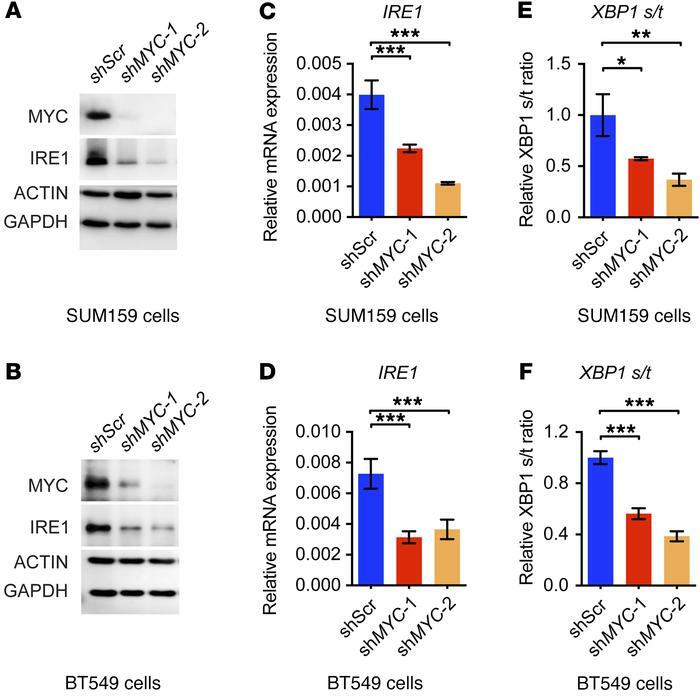 MYC is necessary for activation of the IRE1/XBP1 pathway. (A and B) Immunoblot of MYC and IRE1 in SUM159 cells (A) or BT549 cells (B) infected with lentiviruses encoding control scramble shRNA (shScr) or 2 distinct MYC shRNAs (shMYC-1 and shMYC-2). Actin and GAPDH were used as loading controls. (C–F) qRT-PCR analysis of IRE1 expression and XBP1 splicing in infected SUM159 cells (C and E) or BT549 cells (D and F). XBP1 s/t, the ratio of XBP1s to total XBP1t. The XBP1 s/t ratio was normalized to that of the scramble (shScr) control. Data in qRT-PCR analysis are presented relative to actin and shown as mean ± SD of technical triplicates. All data are representative of 3 independent experiments. *P < 0.05; **P < 0.01; ***P < 0.001, 1-way ANOVA with Tukey’s multiple comparison test.